Aviation industry can drive efficiency and improve overall airline passenger experience using IoT. This session will focus on some of the use cases around the airport, airline and the passenger, leveraging IoT. Today six to seven bags are delayed / damaged / lost for every thousand bags, eroding the passenger experience and speed of door to door travel. As the regulatory landscape changes, airlines will be required to have better visibility of the bags end-to-end. We will dig deep into the working of such a connected bag solution. Such solutions can be extended to other part of the aviation ecosystem by connecting other assets in and around the airports. 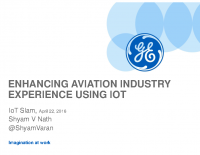 Shyam is Industrial Internet Architect with GE Digital with focus on Aviation Industry. 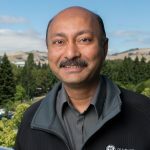 Prior or GE, Shyam worked in IBM, Deloitte, Oracle and Halliburton. He is a regular speaker in large technology events on IoT, Big Data & Analytics. He has an B Tech (EE) from IIT Kanpur (India) and MBA and MS (Computer Sc) from FAU, Boca Raton FL.